Wells Lamont 536L Nitrile Coated Women's Work Gloves protect your hands while you're hard at work. The nitrile coating helps keep your hands dry, while also resisting punctures, cuts, snags and abrasion. The nitrile coating covers the palm, thumb and fingertips for extra gripping power. The gloves have breathable fabric on the back to keep your hands comfortable. These gloves are extremely flexible, and have an ergonomic design for a comfortable fit. These Wells Lamont Nitrile Coated are perfect for farmer, gardening, landscaping, painting, cleaning, and automotive use. 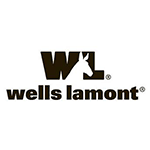 Wells Lamont - Stubborn about Quality since 1907.